This Meyer Lemon Pie packs a ton of sweet lemon flavor with a fluffy texture. 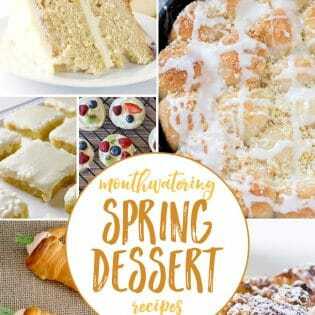 A simple homemade dessert perfect for spring. 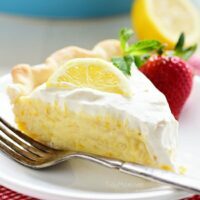 The pie is not overly sweet and has plenty of citrus love all the way through to the homemade whipped cream on top! We need to talk about this Meyer lemon pie!! It’s kind of amazing, and I won’t lie……I’ve eaten several slices since I made it yesterday. 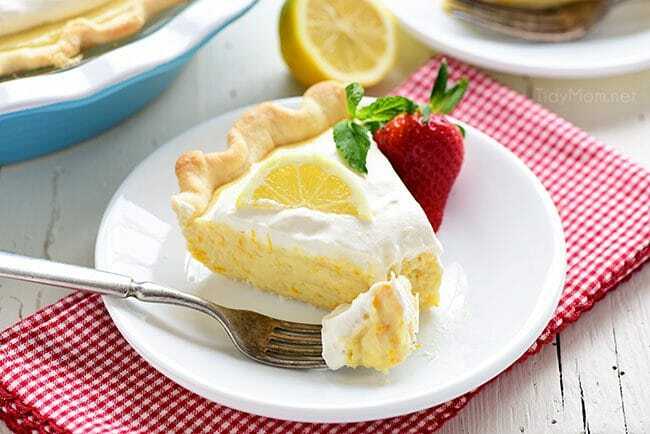 When I’m not eating it, I’m dreaming about this lemon pie!! I’m always in the mood for a delicious lemon recipe, like lemon filled cupcakes, lemon raspberry coffee cake, and lemon burst cake mix cookies, to name a few. My lemon craving was kick-started the other day when I was inspired by Todd and Diane’s gorgeous citrus pie. Because I’m a big fan, I made my lemon pie in a buttery flakey pie crust. Once you have your crust baked, it’s time to move on to the Meyer lemon pie filling!! 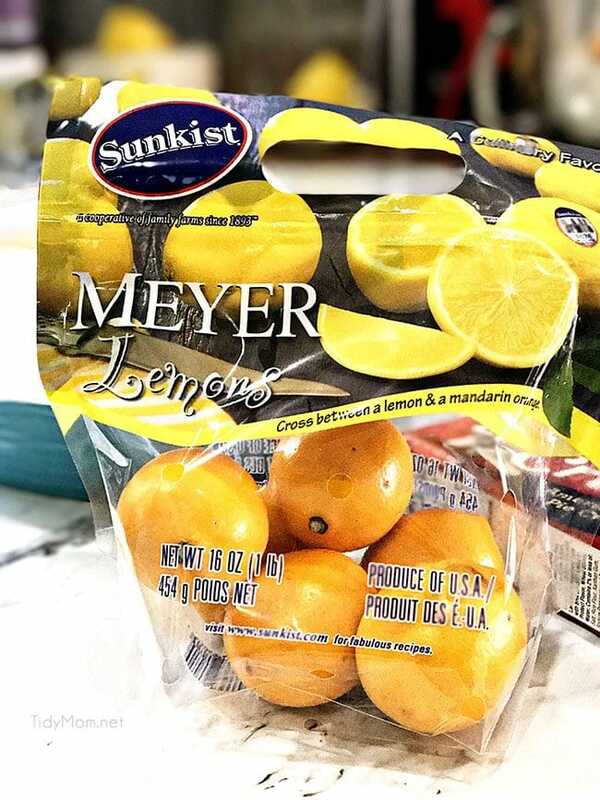 Have you heard of Meyer lemons? 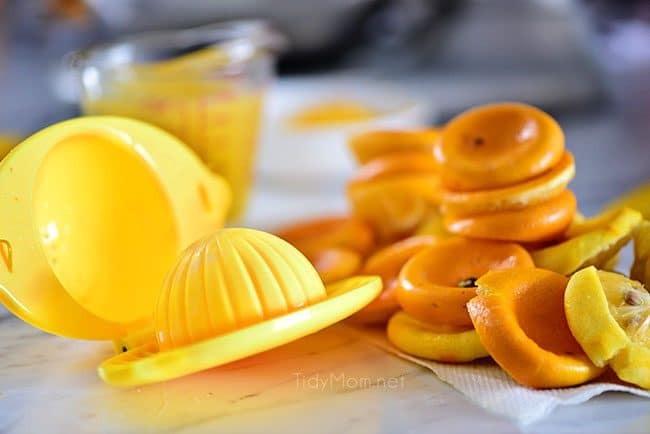 They’re sweeter than a regular lemon, a cross between a lemon and a mandarin orange. Since they don’t have the tang of a lemon, you might even enjoy them in a salad or atop a dessert. They are more round and smaller than a regular lemon, and their color is a dark yellow to orange. Note: This recipe calls for a cup of lemon juice. I squeezed nearly two pounds of Meyer lemons with my lemon juicer to get one cup. Meyer lemon season is December through May, but they can sometimes be hard to find. But I beg you, it’s worth the extra effort to see if you can find Meyer lemons. Their sweetness just hooks you. 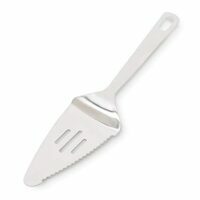 If you can’t find them, you can use regular lemons and add 2 tablespoons of granulated sugar to the pie filling. 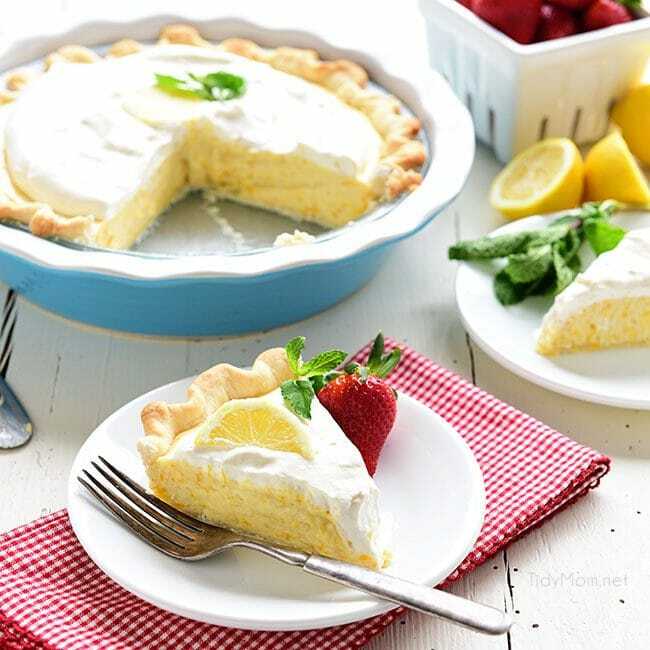 Because of the sweetness of the citrus, this dessert doesn’t have any added sugar, other than the decadent whipped cream on top, making it sinfully delicious, but not nauseously sweet. There are two ways you can go with the crust. You can certainly make your own homemade pie crust, it’s buttery, flaky, and downright delicious. 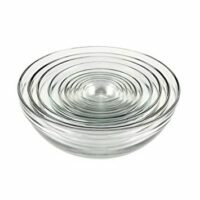 Or you can go the easy route, like I usually do, and use the refrigerated pie crust that you roll out and place in your own pie dish. Rumor has it, that Trader Joe’s has the BEST refrigerated pie crust! If you’re really in a time crunch, go with a frozen pie crust. 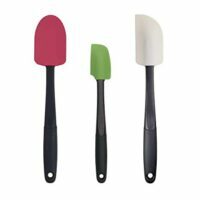 It doesn’t need to be rolled out, they already have a pretty scalloped edge and often hold up really well after baking. Whichever way you decided to go with the pie crust, you need to bake the crust and let it cool. 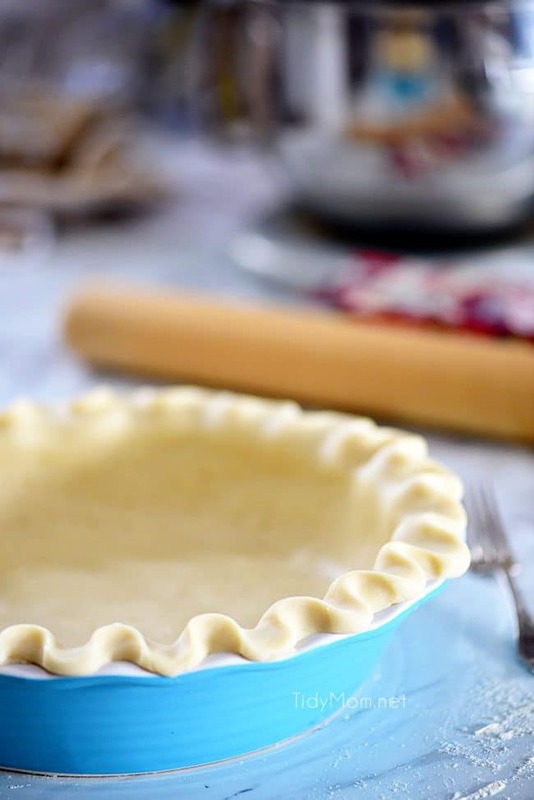 Tip: When baking an empty pie crust it’s best to use pie weights (or beans or rice) to weight down the dough so that it holds its shape, keeps it from bubbling and shrinking away from the pie plate. Line the inside of your pie crust with foil or parchment paper, and fill it with weights/beans/rice. Then, bake your crust according to the instructions in the recipe. The beans or rice will be too dried out to cook, but I just pour them in a mason jar and reuse them for my next pie! Using a large mixing bowl, combine sweetened condensed milk, egg yolks, lemon zest, fresh lemon juice, vanilla extract, and salt. Then, using an electric mixer, beat on low for 1 minute, then on medium for 3 minutes. Now, pour the lemon pie filling into the baked pie crust and bake the entire pie for 10 minutes. 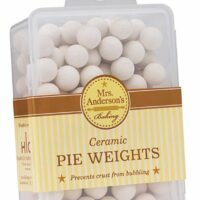 Cool the pie on a wire rack for 15 minutes, then chill in the refrigerator for at least 1-2 hours or until fully set. Using an electric mixer and a large bowl, whisk cold cream, sugar, vanilla, and lemon zest to soft peaks (watch the cream not the clock for this). Spread the whipped cream onto chilled pie. Garnish, if you wish, serve and enjoy!! This is a pie that I will be making again and again. 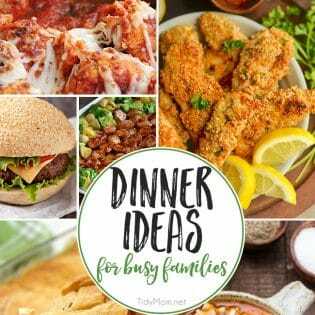 It’s simple enough for any day and perfect for a pot-luck, or an Easter or Mother’s Day dessert. 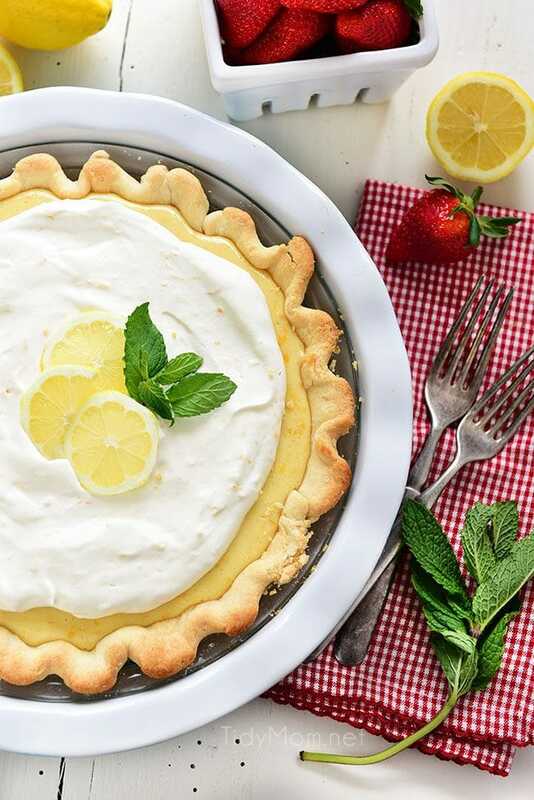 Like this recipe for Meyer Lemon Pie? Pin it! This Meyer Lemon Pie packs a ton of lemon flavor with a fluffy texture to a simple homemade dessert. Pops of sweet tangy Meyer lemons are perfect for spring. The pie is not overly sweet and has lots of citrus love all the way through to the homemade whipped cream for the top! 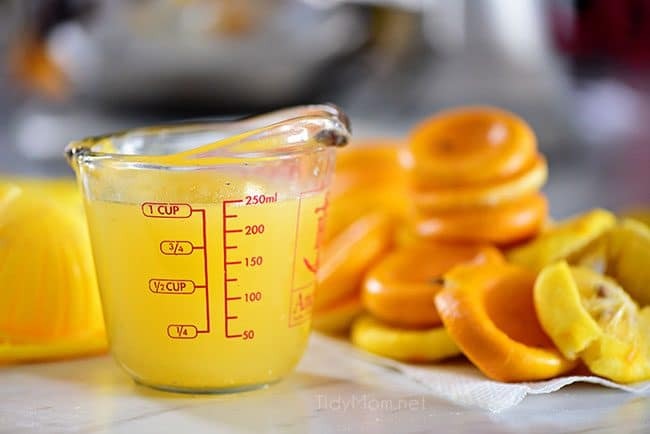 In a large bowl, combine milk, egg yolks, lemon zest, lemon juice, vanilla and salt. Using an electric mixer, beat on low for 1 minute, then on medium for 3 minutes. Pour filling into pie crust. Bake pie for 10 minutes. Cool on wire rack for 15 minutes, then chill for at least 1-2 hours or until fully set. 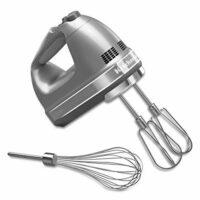 Using an electric mixer, whisk cream, sugar, vanilla, and zest to soft peaks (watch the cream not the clock for this) . Spread whipped cream onto chilled pie. Garnish, if you wish, serve and enjoy!! 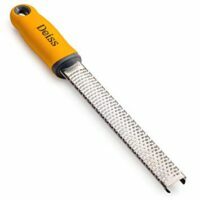 Can be stored in refrigerator for up to two days. Meyer lemon season is December through May, but they can sometimes be hard to find. If you can't find them, you can use regular lemons and add 2 tablespoons of granulated sugar to the pie filling. This is really delicious and this is really amazing. I made this and my family love this. Thank you so much for sharing this blog. Tried this today and I just want to thank you! It was delish!! It looks perfect indeed! I’ll make it for my Easter lunch! So yummy and amazing article. I Love all the recipes and love the figure. Thanks for sharing this blog.. This pie looks luscious! I can almost taste it through the photo! 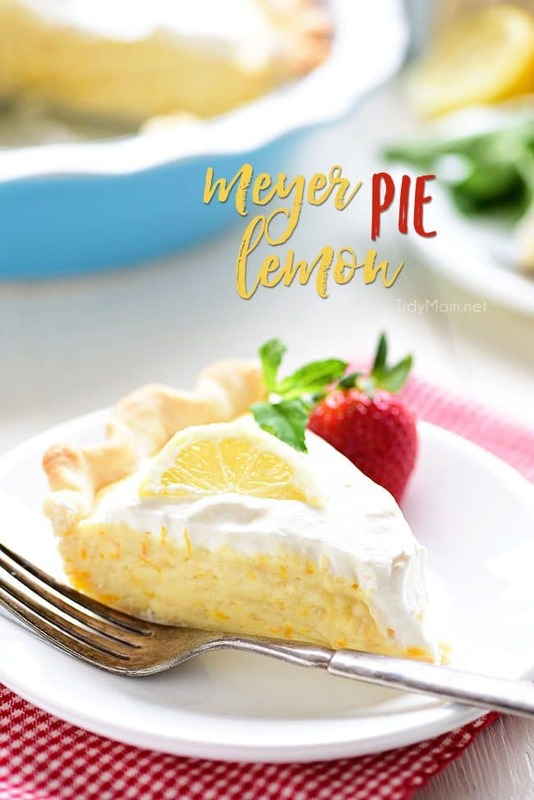 This, as well as all of your other Meyer Lemon recipes look delicious!! We have a huge tree full of them in our backyard and struggle with using them each year. Too bad you don’t live close by- two of my lemons, (organic too) would give you that cup of juice for your pie! They’re HUGE. Made twice the amount for a single Pillsbury pie crust. Hmmm? Easy and delicious! This is perfect! Thank you for sharing this! So love it! You are right! Meyer Lemons do make a big difference in the pie. 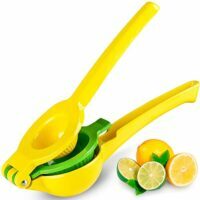 It’s a lot of lemons to squeeze but it tastes so good. There is nothing better than a homemade pie. especially with fresh fruit. Thanks for the tutorial!! YES!! These have such a beautiful pop of lemon flavor and the color is perfect. My mouth is watering just thinking about this pie! I love everything about this pie! 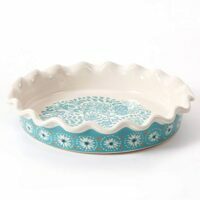 This pie makes me so excited for Spring! Such great lemon flavor! We will be having lamb chops for dinner tonight and I think this is a perfect dessert as it will somehow wash or clean the palette due to its lemon flavor. Thank you for sharing the recipe! My mom used to make this pie when I was a kid 50 years ago. It was my favorite! Well, that and her cherry pie. I was really excited to try this recipe out, found the perfect organic meyer lemons and followed it to a T. However my end result was a meyer lemon soup, NOT a pie. Very disappointed. The whipped cream was yummy but the pie was not. I’m sorry you had trouble with this recipe. I’ve made it several times with no trouble, and the person who makes my recipe videos had no problem either. Not a problem! I am sure you have perfected the recipe but maybe could provide some troubleshooting infornation for those who’s pies don’t turn out. Not sure what went wrong. The video is great but doesn’t show what the pie should look like once it comes out of the oven. I’m wondering how long you left it to chill in the refrigerator? and did you let it cool about 15 minutes before you put it in the refrigerator? Yes, cooled for 15 minutes prior to going into the refridgerator and then it was in the refrigerator for 4 hours, then overnight and still never set up. This pie was not only easy to make, it was absolutely delicious. My husband said he will never leave me now!!! I am making another one for him to take to work.